Years of repair experience has given us a unique perspective on rating the quality of the many appliances on the market today. Our technicians always found Maytag appliances to be the very best available. Several years ago Maytag was purchased by Whirlpool, making them the largest manufacturer of home appliances in the world. It seemed only natural that we should offer to sell our customers the brand we feel is the “Rolls Royce” of the appliance industry. 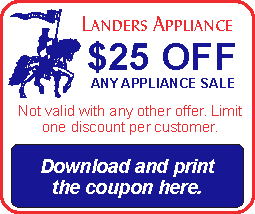 Landers Appliance now offers the full line of new Whirlpool, Maytag, Amana, and Kitchen Aid appliances for sale along with other select brands to meet your needs. We have built our reputation by providing top notch repair service. We apply the same principles to selling new appliances. We’ll reduce your stress and the time normally required in making a new purchase. Many of our customers place orders right over the phone because of the trust and confidence they have in us! We’re a service company that sells new appliances, not a sales company that also does service. There is a big difference. We are not trying to compete with other retailers around town. Frankly, we can’t sell appliances as cheaply as they do because of their huge purchasing power. BUT WE UNDERSTAND SERVICE! We understand scheduling deliveries around our customers busy schedule in order to keep your lives as worry free as possible. We don’t play any games with you. We give you what we said we would give you when we said we’d give it. Straight forward! Hassle free! Easy! Seven Great Reasons to Buy Your Appliances From Us! We know appliances from the inside out! We view all the products we recommend using a service technicians perspective! We know which brands last the longest, have the fewest repairs, and serve our customers well. We’ll help you narrow down the many brands and models available on the market today, making it easier for you to make a wise decision on which appliance to purchase. Our installers are employee’s, not subcontractors! We are able to properly train our installation mechanics and therefore directly manage the quality of their work as well as provide you with a convenient appointment! You don’t have to make extra phone calls to schedule delivery and you can count on us to show up when we said we would! You’ll get personalized care! Call and talk to anyone in the company about, well, anything! 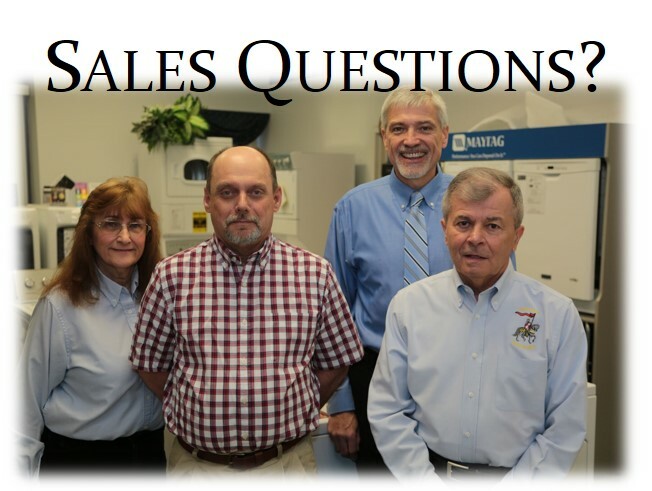 We’ll go out of our way to help you by answering your questions and offering real tangible solutions. Everyone on our staff will work toward a swift, as painless as possible solution for you. You’ll get a very quick response when calling us on the phone! We are normally able to immediately answer all your questions, give you our recommendations, quote you a total price and offer you a delivery time within the next 48 hours! If you want more information, we’ll e-mail or fax specifications and price quotes to you right away. You’ll enjoy “One Stop Shopping” for all of your appliance needs! With one phone call you can discus and order a new appliance, schedule a service appointment, get repair advice, order a part, purchase a service agreement on your new appliance, and everything and anything else related to your appliances! You can buy a “Total Appliance Protection” service agreement! We offer our own extended warranty plan at reasonable prices, providing you with peace of mind coverage! You can pay one low price for up to five years of unparalleled service! You’ll get award-winning service, in and out of warranty! We provide manufacturers warranty service on those products we sell and we also service all brands and models out of warranty. You can avoid having to wait many days or even weeks to get your new appliance repaired when you buy from us. Personalized service with a family friendly feel!